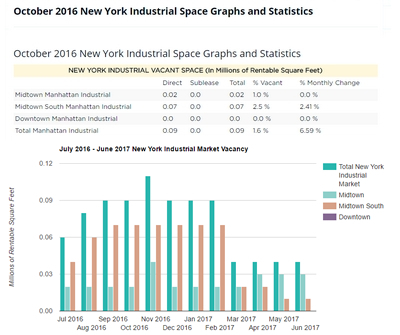 Manhattan office leasing picked up pace after the US election and companies went back to business. Prices remain firm while concession packages continue to increase marginally. 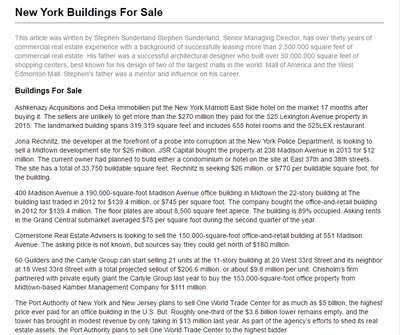 News Corp. and Fox rented a combined 1.2M SF at 1211 Avenue of the Americas. 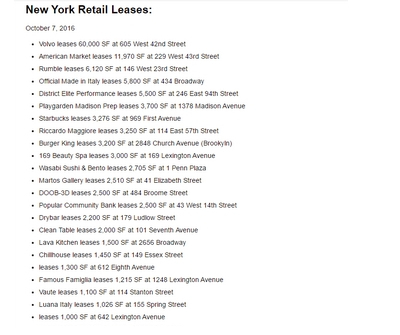 Manhattan Retail vacancies increased as stores claused due to rising landlord's rent aspirations. With Banks reducing their retail footprints and online retail causing reduced street sales, retail is likely to continue to suffer and retail prices will continue to fall. 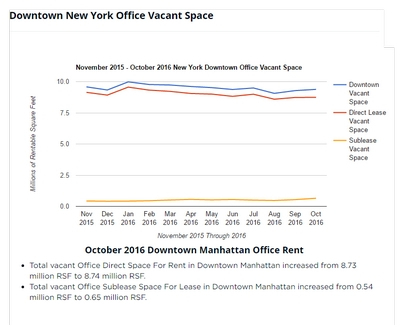 Manhattan office leasing has been on a gradual downward trend over the past 12 months. 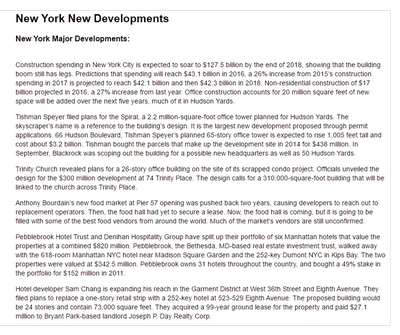 Tenants in 2016 leased 33.1 million square feet. The vacancy rate rose to 10.4% from 10% in 2015. 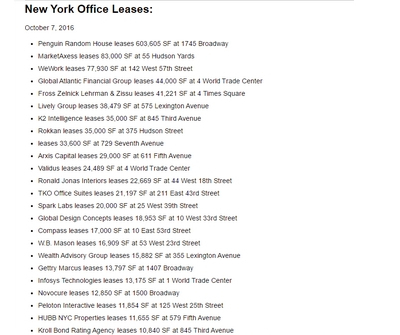 2016 was the third-highest office leasing total in the past 10 years, behind 37.38 million square feet in 2014 and the 33.92 million square feet leased in 2013. Investment sales in Manhattan declined 38% to $38.9 billion after 2015’s astronomical $63 billion. 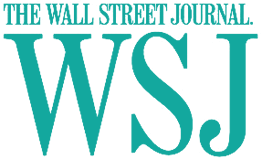 Office rents are projected to grow 1.5% in 2017, and retail rents to grow 1.7%. 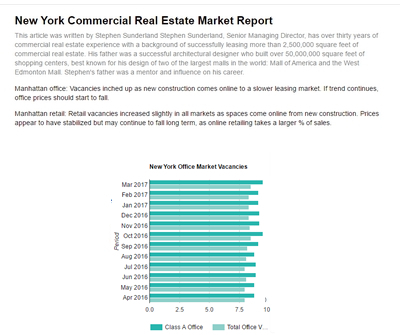 The Manhattan office market closed 2016 with an average asking rent of $72.82 per square foot, and 12.5 million square feet under construction. 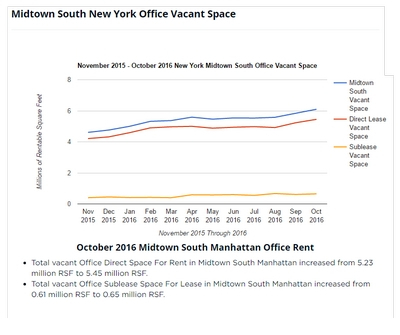 In 2016, 106 transactions were completed at starting rents of $100 per square foot or higher, representing 9% of the 24 million square feet leased in Midtown and Midtown South in 2016. 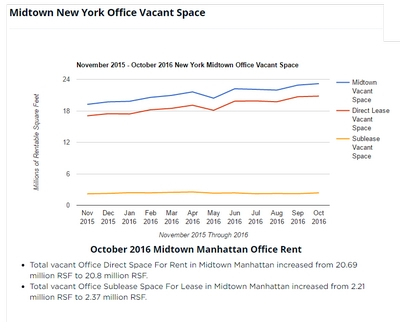 The vacancy rate for Midtown trophy office space rose from 7 to 8.8% in 2016, while the average asking rent rose from $103.61 to $104.41. 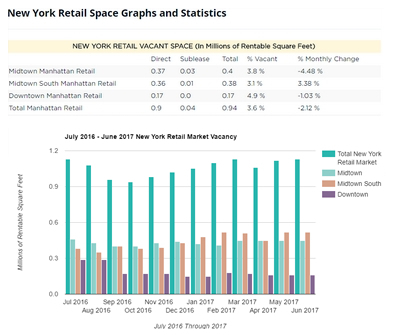 Manhattan’s retail rents fell in 2016, but some predict it is only the beginning. One indicator of potential future rent decreases are availability rates, which remain precariously high in some sub-markets. 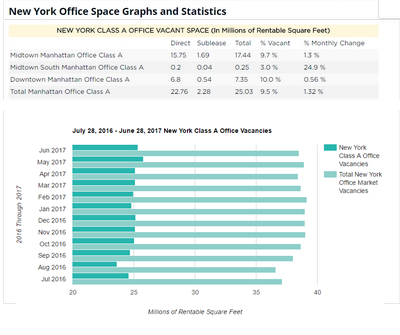 On Fifth Avenue in the 40s, 31% of storefronts are available for rent in the fourth quarter, but rents fell by a mere 1.1% compared to the fourth quarter of 2015. 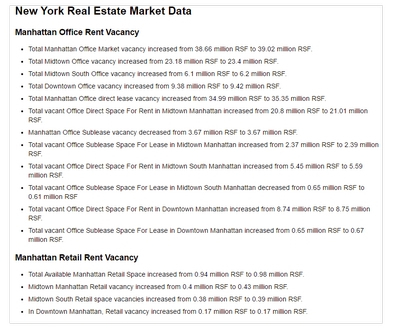 On Madison Avenue availability stood at 23%, rents fell by 12%.